Basically this is a “what happened until now post” as kick-off for the battle among the stars devblog. If you have me on facebook, you most likely will already have seen the screenshots from the first 4 days, so there won’t be much new in this post. In the future I plan to use this category of my Blog for my Dev-Diary. I didn’t blog about this, but last year in december i tried to take part in the Ludum Dare 31 – and I failed horribly, which is probably why i didn’t blog about it right away. 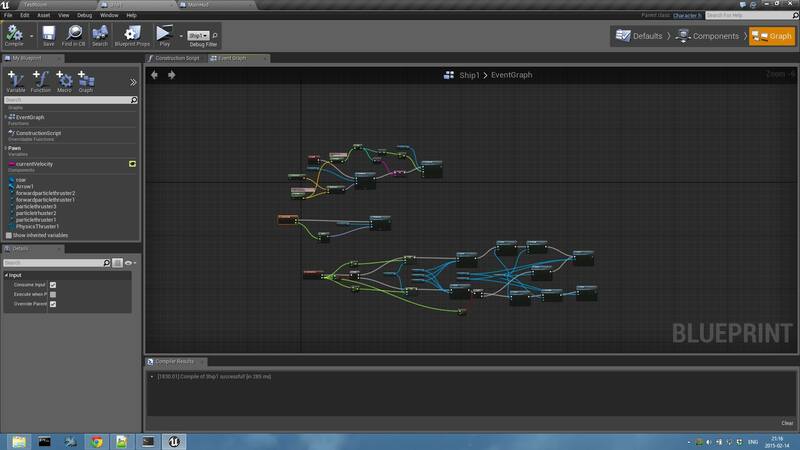 Now even though I failed, I liked what I saw from the unreal engine during that time. So I decided to go ahead and build a game outside of a GameJam with it. what is this game going to be like? 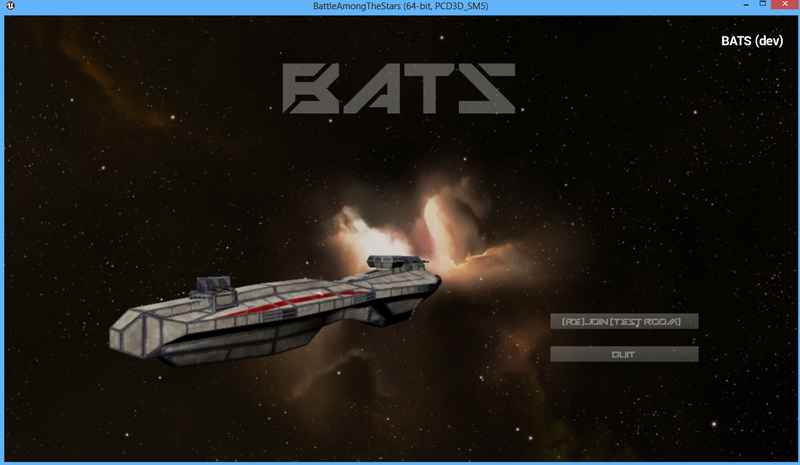 Online, Multiplayer, 3D, top down, Spaceships, Shooting, Tactics, Resource Management, PvP. On day one I mostly spend my time learning a few more of the basics on how to work with UE4, as well as creating a first pretty rough frame for the game. At that time I hadn’t made a decision on using 3D graphics yet, I was spinning around the idea to use 2D graphics, but particles in 3d space for effects and such. 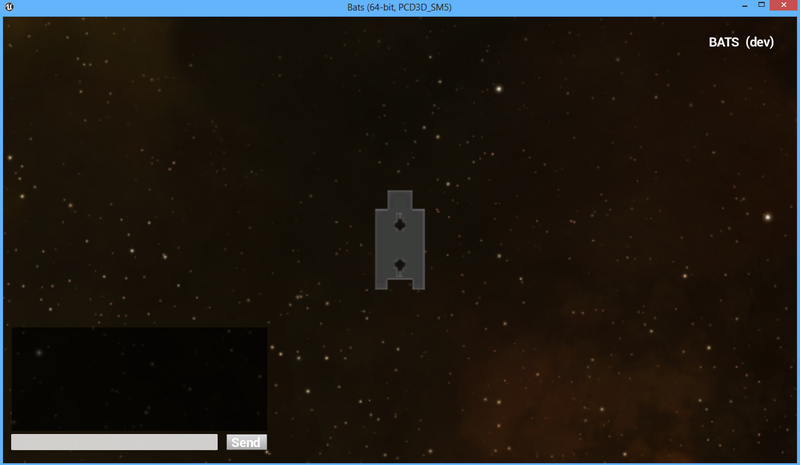 At the end of Day 1 I had a running application, which would display (and allow to move) a simple 2D ship actor. While i can build a simple Model of a Spaceship, I’m no 3D artist, also I seem to be completely unable to come up with cool Textures. Also asset creation costs me a lot of time that I actually would prefer spending with things that I enjoy. So i bought a pack of simple Ship Models – for now they are good enough, and i expect to replace them at *some* point. 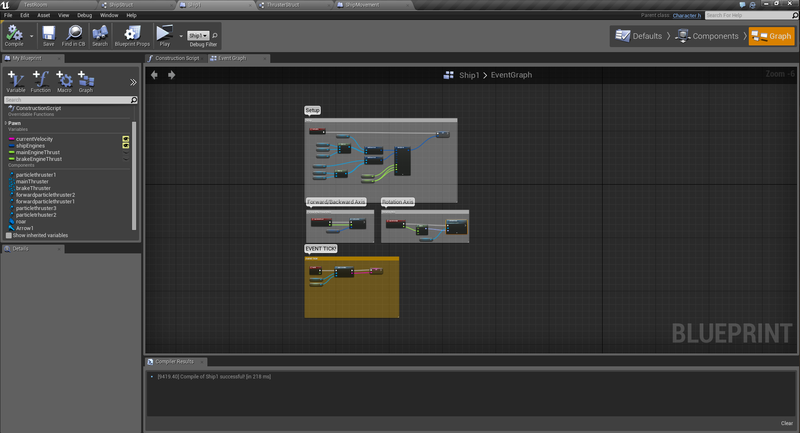 Besides toying around, and getting to those two conclusions I set myself to build a menu screen for the game. once I was happy with that, I actually created a git repository, as I reached the point where I didn’t want to start over again, if something goes wrong. As long as I work alone on this, there won’t be much of a problem with git, but i learned that UE4 saves blueprints in a binary format, which has the downside that git won’t be able to do merges, and conflicts are solved by throwing away the changes of one of the two contributors. But I decided not to care about that for now, as I’m flying solo on this one. on day 3 I finally started making some good progress, i created the actual test-map that I’m using to try out the things that I’m building and then build a Ship actor, which is now moved around by applying thrust. Once that was working, I spend some time creating a particle system for the thrusters, which will give a nice visual indication of which thrusters are active. I was only using one thruster for forward/backward movement, by having the thruster (mounted at the rear of the actor) apply negative thrust for when the braking/forward-mounted thrusters should fire. At this stage I remembered something from last years global gamejam, where my team build a space-ship game aswell: If you don’t have a visual indicator on where your ship is going, then navigating (and stopping) gets quite hard. So I created a similar solution what we did back then, and added a direction guide. At the end of day 3 I was quite happy with what i had achieved, and then I looked at my blueprint, which gave me the feeling of creating a big mess – the logic I had created shouldn’t be attached to the ship, and it seemed quite chaotic. Today I spend most of the time refactoring what I did during the other days, to get less chaos and a better basis for building upon. I also removed one of the two cheats from Day 2, the braking-thrusters are now actually backed by an own physics thruster. Also the weight of the ship, and the amount of thrust applied by the thrusters is now much more realistic (than the 60kg that the ship had before ;). However the screenshot of today is probably rather boring, as it simpy shows the refactored blueprint of what was a big mess in Day 3.